As a traveler, I often find myself looking for a quick and nutritious bite on the run. And Jamba released a new line of dining options that meet that need. The first products up for review are the Grab and Go wraps pictured above. 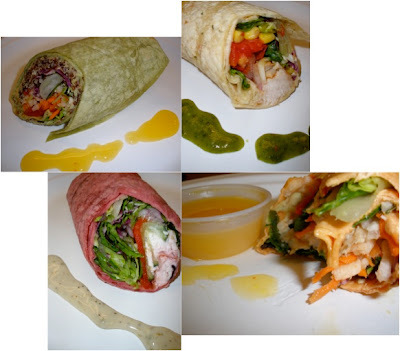 Clockwise starting in the upper left: Greens and Grain Wrap, Chimichurri Chicken Wrap, Asian Style Chicken Wrap, and Greek Goodness Wrap. This wraps are HUGE. Each of the pictures above is only half a wrap (er the Asian Style Chicken is maybe only a quarter!). Jamba makes these wraps with no transfats, high fructose corn syrup. artificial flavors or preservatives. They are premade and stored in the display cooler for customers on the run. GREENS AND GRAIN WRAP: This wrap is made with a tortilla that has spinach powder in it. A hummus made fresh is used along with red quinoa which provides protein. There is also a burst of crisp fresh produce that provides a satisfying crunch when biting into the wrap. The hummus and quinoa add a nutty flavor to the wrap. The dressing is a sweet mango that adds another dimension to the wrap. The dressing, as with all of the dressings, are stored in a seperate container for customer control. This was probably my favorite wrap between the contrasting textures and flavors but it is also extremely filling. You could probably enjoy half now and half later! The wrap alone is 600 calories/14 grams of fat/9 grams of fiber/19grams of protein. Add an additional 40 calories (no additional fat/fiber/protein) for the dressing. CHIMICHURRI CHICKEN WRAP: This wrap has a lovely combination of flavors between the chile & lime grilled chicken breast and the locally sourced produce including corn and peppers. This wrap is served with a chimichurri sauce that adds a kick to the wrap. But those who are wary of spice, have no fear. It is a flavorful spice, not a burn your tounge spice (which I was hoping for), thus more palatable to the general public. The flavor profile is complex and it is definitely a healthy choice but be wary of the delicious dressing! The wrap alone is only 410 calories/9 grams of fat/2 grams of fiber/22 grams of protein. The dressing adds an additional 150 calories/16 grams of fat/1 gram of fiber (no additional protein). ASIAN STYLE CHICKEN WRAP: The lowest calorie wrap on the menu, this wrap is a light option for folks on the run. I felt like the chicken could use a bit more seasoning, but also recognize that I tasted this after a couple of heavier wraps so I will give it another go before passing judgement. The wrap includes jicama, field greens and other veggies wrapped in a tortilla that includes tomato powder. It is served with a delicious and low calorie mango dressing that is similar to the one found with the Greens and Grain wrap. Enjoy the dressing! Alone, the wrap has 400 calories/7 grams of fat/5 grams of fier/19 grams of protein. The dressing only adds 30 calories and no additional fat/fiber/protein. GREEK GOODNESS WRAP: If you like Greek salad then you will love this wrap. Utilizing a tortilla flavored with beet powder, the wrap includes feta cheese, chopped kalamata olives and fresh field greens. The dressing is a Greek vinaigrette that incorporates a low-fat cholestrol-free mayonaise in it. I loved this wrap with the dressing because the herbs in the dressing balanced sweetly against the strong cheese and olive flavors in the wrap. Unfortunately, I had to use the dressing sparingly, because although it used healthy ingredients, it is still relatively high in calories and fat. Without the dressing, the wrap is 440 calories/16 grams of fat/2 grams of fiber/15 grams of protein. The dressing adds an additional 110 calories/10 grams of fat (no additional fiber or protein). Tomorrow I will review the new Tea Infusions that Jamba rolled out today. I would pair the wraps with these new tea infusions or a small enlightened smoothie to keep the beverage calories down but to still get some fruit servings into your meal. Yum, these wraps sound great! Wish I could get them here.